Bad photoshop courtesy of the author. The crew of the Enterprise has certainly got into a lot over the years. They’ve palled up with the X-Men. They’ve met the Eleventh Doctor. And now, they’re facing a whole new threat: Xenomorphs. Announced at Diamond’s retailer summit at London Film and Comic-Con this morning, IDW and Dark Horse are collaborating on a new miniseries that will see Picard and his crew face off against the deadly aliens that will probably leave more than a few poor redshirts with big gaping holes in their chests (well, I guess technically yellowshirts, given that this is TNG). Not many details about the series are known so far, other than that it will be written by Scott and David Tipton, with art by J.K. Woodward, but it certainly is an idea with a lot of potential. 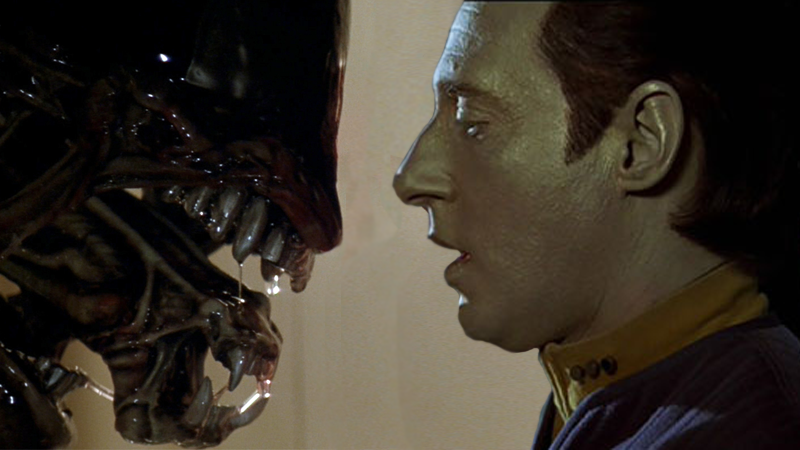 We just want one thing to happen: Borg Xenomorph. God, can you imagine? Star Trek: The Next Generation/Aliens is set to arrive in Spring 2017.